Residents and visitors to Dubai Motor City can now enjoy a quick shot of java and freshly-baked donuts without having to search far for their favorite Dunkin’ Donuts outlet. The world-leading coffee and baked goods chain announced the launch of their latest outlet at Uptown Motor City, a development that will be welcomed by the myriad fans of the brand in the UAE. The expansion is part of the Canton, Massachusetts-based quick-serve giant’s strategy to spread its presence to all corners of the Emirates, which is increasingly becoming a significant market in the burgeoning Middle East region. Speaking on the occasion, Dunkin’ Donuts General Manager, David Rodgers said: “The new outlet is our 61st location in the country, which should become increasingly popular with visitors and residents of the upscale community. Our expansion is part of the company’s continuing response to strong demand for our products in the country. 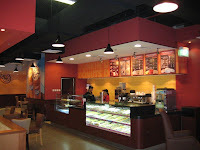 “With the increasing popularity of our high-quality baked goods and select coffee blends across the country, we plan to add a total of 11 outlets across the emirates in 2011. Our strength is the unmatched combination of our superior blend of coffee and a wider range of donuts than any other coffee shop in addition to dedicated standards of customer service,” he added. With the opening of this outlet, Dunkin’ Donuts has once again demonstrated its commitment to the region, for which it has an investment outlay of more than AED10 million spread over the next three years. Uptown Motor City is a residential and lifestyle development designed for motor sports enthusiasts and those who prefer being near the iconic Dubai Autodrome. Apart from a range of apartments, the development includes parks, schools, retail outlets and recreational areas. Dunkin’ Donuts is the established leader in the market for coffee and baked goods with a robust worldwide presence in 31 countries. Currently the company has more than 9,000 outlets across the globe. They want to serve the best service to the customers and thus ask for the feedbacks.